I've had some guided days in the last couple of weeks, but haven't gotten around to reporting on the fishing in a while. Two weeks ago, I guided my old friend Henry Bone and his buddy Patrick. I expected us to do very well, given the fact that Henry is a top-level fly fisher. But the fish were tough to find. Still, we did pretty well after finding them in an unexpected westside venue where no one, I repeat, no one fishes. It was just one of those lucky finds, thanks to Patrick who wandered off a bit while Henry and I were clinging to the familiar. I noticed that he didn't seem to be in a hurry to return to the boat after Henry and I had give clear signs that we were ready to move. When he did return, he had good news to report. So Henry and he headed back into the area where Patrick had seen reds feeding. They only caught a couple, but given the low catches we've had during the mid- to late summer, it was a good find. 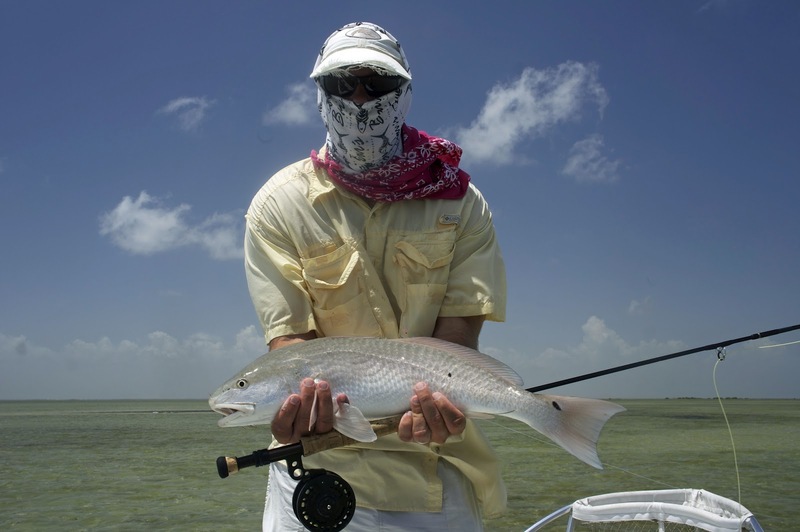 On our second day out, we had full sun, so we fly fished the far east side of the bay near Three Islands, and had excellent action in the Bahamas-like gin-clear flats. It was quite exciting for me to pole them through such breathtaking water. Patrick had never seen the particular area. After we'd caught a few in that area, the weekend had been "made." Last weekend, I was finally able to guide Chris Beardsley from Portland, Texas, after having to reschedule twice. We faced an ambiguous forecast that called for a near-perfect day preceding our first cold front of the season, and a much winder day following its passage. FYI "Cold front" is usually a misnomer this time of year, because when it passes through, it brings more wind and rain than cooler temperatures. 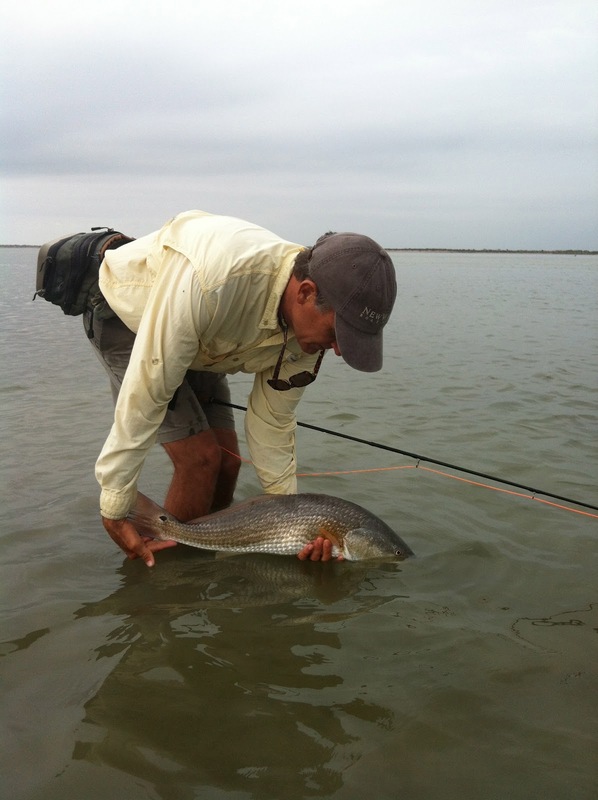 Chris had only recently taken up fly fishing in saltwater, and had previously shifted to spin fishing whenever he didn't feel comfortable with the long rod. Knowing that becoming proficient would require a higher level of commitment, he booked two days with me and left the spin rod at home. We had excellent weather conditions for first morning--low wind, and the promise of a full sun. Finding nothing north of the mouth of the Arroyo, we headed back south and entered a back lagoon as another boat was leaving. The captain of that boat held up one finger. Knowing that he could have never accessed the back reaches of the lagoon, I went in, confident that we would be able to fish water that he had left untouched. Sure enough, after planing through painfully shallow water, and shutting down, it became clear that we were into the fish. I poled Chris downwind for over a mile over the course of two hours, and had numerous high-vis encounters with feeding redfish. Some were very big. Chris did pretty well for his first fly-only excursion on the Lower Laguna, and was quite happy with the opportunities that we found. Later, we headed to the sand, hoping for a "turn on" in the afternoon. Alas, we found few fish, but Chris succeeded in hooking one more that broke his line on the first blistering run. When I examined the line, I saw that the line had broken at my blood knot. I said, "You should blame the guide for this one." That night, we weren't sure what the weather would bring. A weak cold front was forecast, but around 4 am, the area was slammed with thunderstorms. I awoke at 5:30 convinced that it was hopeless to try to fish. So I called Chris and suggested that we pull the plug. He agreed, and we both went back to sleep. Two hours later, however, I woke up to a fairly calm morning, and light diminishing rainfall. I called him again and suggested that we go out. But by then, he'd already told his family that he was heading home. So...it was the guide's time to fish. 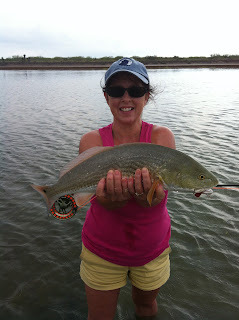 Julie and I headed to the same lagoon where Chris and I had found so many reds the day before. I planed beyond the easy-access areas, and shut down in "no" water. Reds were everywhere. In fact, while I strung my rod and tied on my spoon fly, several reds passed by the boat, driving huge visible wakes. Once we got out of the boat, we began to notice tailing fish in small pods working the shallow clear water. The wind was already rising, but the fish didn't care. In the span of about an hour, I hooked five fish--on over 28 inches--and landed three of them. I had several more shots, but line management was difficult in the grass-filled water, so I messed up several good opportunities. After catching three, we headed in, happy that we'd been able to spend some time together on the water, but disappointed that I'd pulled the plug prematurely on Chris' second day on the water.